It's January, which means that the weather's rubbish (in the UK at least) and money's tight (that's probably true wherever you live). 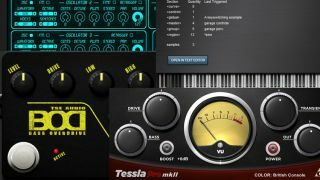 So, what better time than now to settle yourself in your studio and make some music using some new free software? This transient aware signal saturator now has an expandable 'colour model' architecture and includes five different models. Three of these are console-styled and the other two emulate a tube stage and tape warmth. If you want to give your bass some dirt, this emulation of a well-known overdrive processing box could do the trick. This revised version sports a new interface, a low/high quality switch, improved op-amp modelling and dynamic saturation. This advanced version of T-Force Alpha TS has all the features of the aforementioned synth but also adds new synthesis options (there are both subtractive and FM options), revised oscillators, new mod envelopes and an integrated sidechaining effect. This lean-looking SFZ 2.0 sample player has just one instrument slot, no fancy interface and no effects or mixer. What it can do, though, is play back files in this royalty-free format, while SF2, DLS and Acidized WAV files that are dropped in will be converted to it.